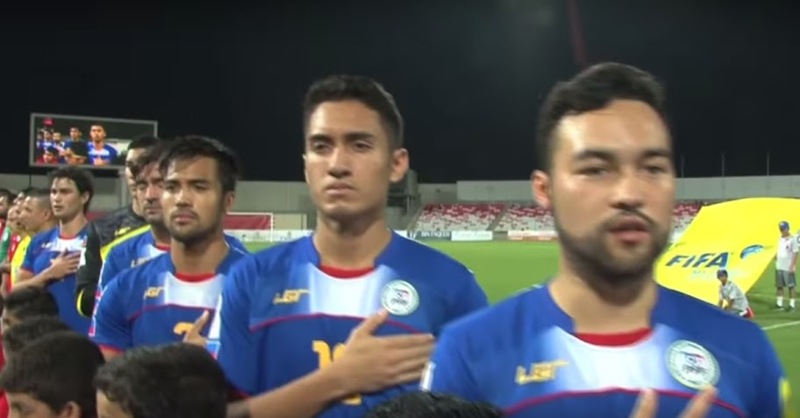 All images in this page captured from video on the AFC Cup YouTube channel. The only way to perhaps get a sense of perspective on the Philippine Azkals’ largely insipid performance in Manama last night against Bahrain in a World Cup qualifying match is to imagine an entire squad of players reprising Steve Martin’s character in the 1987 classic Planes, Trains and Automobiles. Excepting, of course, that for the Azkals it was mostly planes and airport layovers in an epic 60-hour trek from one edge of the great Asian continent to another, something that Genghis Khan and his hordes would have found just as numbing. Bahrain, it has to be said, dutifully played their part. That the visit was potentially tricky for the Azkals, the encouraging draw in Pyongyang notwithstanding, was always a probability. For this, they need not look farther than the Uzbeks, who enjoyed a four-goal romp in the same city last Thursday, to find who are entirely to blame. Such a chastening defeat at home for a country that in recent years twice narrowly missed the World Cup bus could have severely damaged morale and paved the way for the Azkals to have an evening stroll in the park. On the other hand, Bahrain do have in Sergio Batista a World Cup winner, so that a backlash was also every bit a probability. That the latter was the case was evident as soon as the match commenced. This was not the languid purposeless Bahrain that resorted to theatrics at the Philippine Sports Stadium last June as its lame response to going a goal behind. Instead, Bahrain last night chased, harried and snapped into tackles to prevent the Philippines from getting any semblance of a passing rhythm. 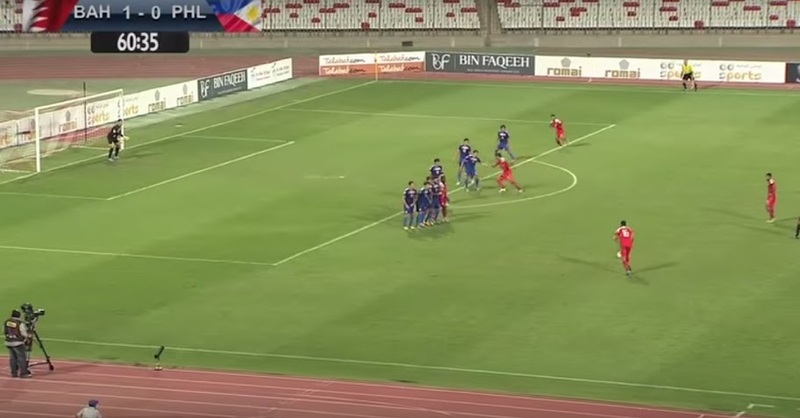 Significantly, despite a speculative shot by Phil Younghusband early on in the match, the Philippines were not troubling Sayed Jaffer enough in the Bahrain goal. It has to be pointed out, however, that Ismail Abdul Latif’s 53rd minute opening goal was not even suspiciously offside. It was offside, full stop. How the assistant referee at the far end missed it is the sort of oversight that makes referees and their assistants among the most abused people on the planet. Bahrain's opening goal was not suspiciously offside. It was offside. There was also the little matter of Daisuke Sato, who was having one of his rare indifferent evenings, being caught ball watching at the most unfortunate time. While the first half Azkals performance was bland and crying for the energy and doggedness of a Misagh Bahadoran, there was also a bit of misfortune in that the little man’s first significant contribution was to concede the foul from which Bahrain scored their second. Sayed Adnan Hussein’s free-kick in the 61st minute was exquisitely taken; but Neil Etheridge also laid down the welcome mat right side of his goal with an invitation to shoot. Half a step to his right and Etheridge could arguably have reached the ball to parry. Pairing Younghusband with Stephan Schröck upfront was probably a kneejerk reaction to DPR Korea and Uzbekistan taking control of the table. To be fair, Thomas Dooley had every right to try and push this campaign as far as it is capable, else we will never know what our team is made of. 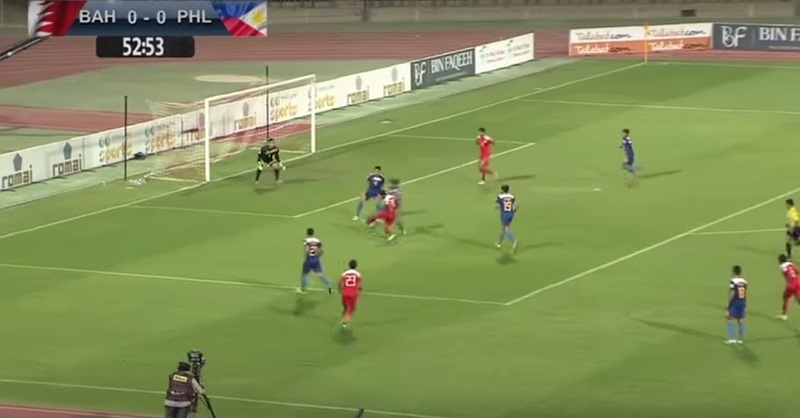 Neil Etheridge was probably a tad generous with the space right side of his goal. However, while there were glimpses that this partnership could flourish, by and large the two were not on the same page last night. Moreover, while on record Younghusband is the Azkals’ leading marksman, his best work of late has been in the middle of the park where his presence was missed last night. The sooner, therefore, that Javier Patiño is fit and leading the attack, the better it will be for the entire team. At this point in the campaign, it is for those who follow the fortunes of the Philippine Azkals to hold on tight to the handrails and enjoy the peaks and falls of the rollercoaster ride. To be third in the group table with three matches remaining – two of which are at home – and still occupying the slot seeded into the 3rd round of Asian Cup qualifying is something we all would have embraced with open arms before June. To put things in perspective, the People’s Republic of China are in exactly the same position; and in a group that includes Hong Kong, the Maldives and Bhutan. Ditto Singapore, four-time Southeast Asian champions; and Vietnam, our tormentors in last year’s AFF Suzuki Cup. Then there are the Malaysians, whose indifferent form has mortified an entire nation; and whose campaign has seen a 10-nil away rout by the UAE as well as a 0-6 home defeat to Palestine. While the Azkals are suddenly looking behind their shoulders after last night’s result, crucially Bahrain’s remaining three matches include trips to both Pyongyang and Tashkent. We all have every right to believe that the Azkals are still better placed to hold on to third place. Then again, this is football; and nobody really has a crystal ball. Perhaps the gods of football will sneeze and our rivals will slip up where they are least expected to. We will all know come March; and however this campaign ends, we still added feathers to our caps by defeating Bahrain for the first time and keeping out DPR Korea in the hostile cauldron of Pyongyang.